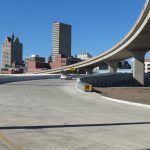 The I-794 ramps at Lincoln Memorial Drive in Milwaukee are a lynchpin in the transportation system near Lake Michigan. The ramps allow motorists access to the lakefront area as well as to the Historic Third Ward. Lincoln Memorial Drive is the main access point to the Summerfest grounds and other lakeside attractions. When this interchange needed reconstruction, it took complex design solutions to meet the needs of the area. 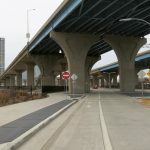 GRAEF determined that the interchange might be the simplest part of the project – by redesigning the ramps and connections, the space around it can be redeveloped into a park. What was more complicated was the traffic staging and stormwater impacts. The traffic signals along the street were designed to be responsive and fully adaptable to future technology; on-ramp detection ensures traffic does not back up onto the interstate. Combined, this will accommodate traffic event routes into the area for festivals. Another key feature was the attention paid to local concerns. The design features multimodal accommodation and allows pedestrians access to the lakefront, event grounds, museums and the Historic Third Ward. The design team had to work in a complicated environment and anticipate future needs to minimize future construction. The project was completed on time, on budget and showed how the right design can integrate innovative solutions into every project.